I’m an overly prepared person. It’s a running family joke about me always planning our days in advance…even on vacation. So I was surprised to find out that a lot of people don’t prepare ahead for hurricanes. 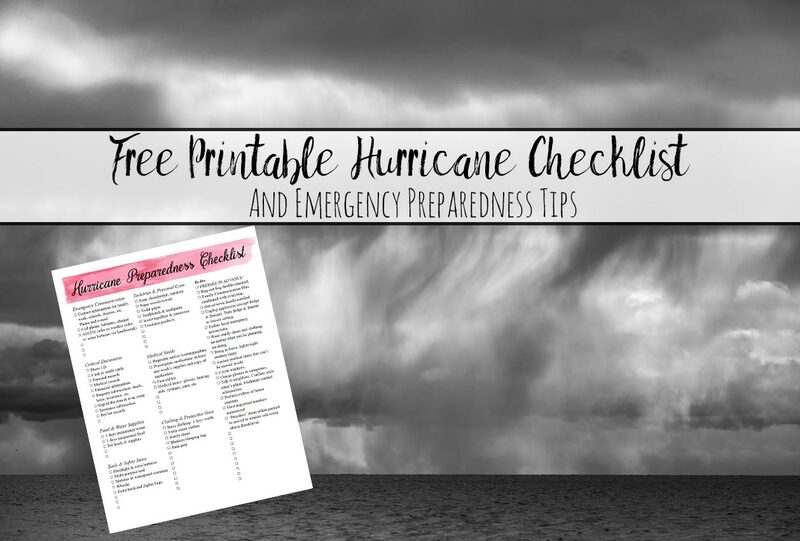 But a reader made a great suggestion: a free printable hurricane preparedness checklist. She had friends who had to evacuate last year suddenly. So she had some great tips and suggestions for the checklist. I’ve also incorporated what I’ve learned over the years of living in hurricane country. We’ve only had to evacuate once (well…we were supposed to two other times, but like many- I laugh at Category 1 and 2’s). But being prepared in advance made it almost painless. I can’t imagine how painful it would have been had I not had all the prep done in advance. In case you were curious…we evacuated for Irma. You don’t mess with a category 5! I’ve also included some emergency preparedness tips below! If you don’t read it all, a summary in one simple phrase: PREPARE IN ADVANCE. If you can think of anything that needs added, comment below! This is the longest section. And for a good reason. Most of the preparation you do for a hurricane needs done in advance. There isn’t time in the midst of a sudden evacuation to find 100 items. And it’s way too late to make sure your insurance coverage is adequate. So if you live in hurricane country, do these things today. Not the day before the hurricane hits. •Identify several places you can go in several different directions (if that’s possible). I realize in the Keys, you only have one option. •Identify places that allow pets, if you have one. Many emergency shelters only allow service animals. •Don’t underestimate how fast hotels inland will book up. Plan on traveling further or leaving earlier. Also don’t underestimate the storm. Many people from South Florida evacuated north during Irma. Only to have to evacuate again as the storm went up Florida in a straight line. •Know not only the main route, but alternate routes. •Know/Be aware of alternate means of transport. If you only have one vehicle, know where/how the buses for evacuation work in your area. Develop a family/household communication plan, especially if at risk of getting separated. Have a place where you will gather. Have an out of town contact responsible for coordinating communication. Example: husband and I evacuate in different vehicles. 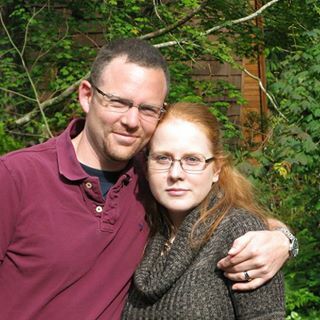 We might evacuation at different times; he’s in the military. We have a place out of state to meet. And we coordinate communication through my Mom. She knows she is responsible for keeping everyone up to date. • You might want to set up a Facebook group message in advance with everyone in your circle. We do this every year…yes, every year. Our family worries. It’s easier to update everyone saying “It’s only a Cat 1, we’re not evacuating at this point” via message instead of 10 separate messages. Assemble supplies in advance for evacuation (there are suggestions below). Every person in the house should have a bug-out-bag in case of having to evacuate unexpectedly, on foot, or by public transport. Don’t forget the needs of pets. Assemble supplies in advance for “bugging in.” I live in hurricane country. I realize that we often laugh in the face of 1 and 2’s. Sometimes 3’s. So we don’t always evacuate. But having supplies in advance in the house and preparing is smart even if you’re staying. Especially since power often goes out and others might evacuate. You’re going to be on your own. Prepare for at least 10 days. Don’t forget the needs of pets. Review your insurance policy– you should have either homeowners or renter’s insurance. See if flooding is covered- most insurance policies don’t cover it. Consider having documentation of valuables. Speaking of documentation. Snap photos of important documents and save in the Cloud. Or have copies stores with family you trust in a safe location. Sign up NOW for your local emergency notification system. Most areas even have apps now! Local news stations often have special apps. Trim trees near the house. Loose branches can easily be ripped free. Consider any home reinforcement you want. Declutter drains and gutters regularly. Keep gas tank on car car at least half-full at all times during hurricane season. Consider having extra gas (stored properly). Be prepared financially. I have a free printable budgeting binder, if you’re interested. Have all your important information organized in advance. I cannot emphasize how important this is. You need contact information for family, work, school, doctors, etc. including both phone numbers and e-mail. Having medical history easily accessible is also a good idea. Having contact information, account numbers, etc. for all financial institutions (including credit card companies) is important. And if you might have to board a pet while traveling, having your pet’s records is vital. If this seems overwhelming, I actually have a binder dedicated to getting organized. Check out “Life Organized“, a single resource to help you get organized for good. 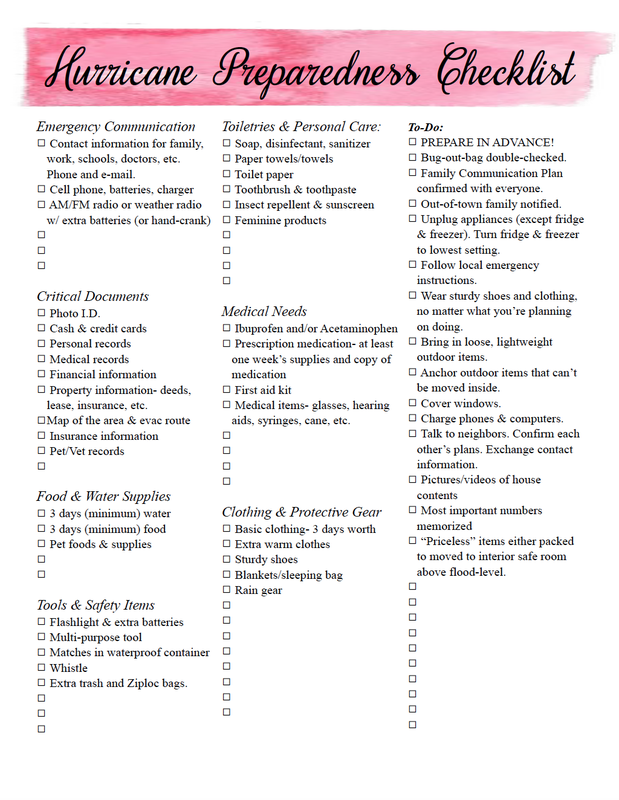 Have a hurricane preparedness checklist and packing list already printed. Don’t depend on being able to access computer or internet. It’s the week your computer’s broken or the local internet is out that a crisis happens. Murphy’s law. The checklist below includes these items. •Unplug electrical equipment. Leave freezers and refrigerators plugged in unless there is risk of flooding. Also turn fridge and freezer to coldest setting. •Follow local instructions on shutting off water, gas, and electricity. •Leave a note telling others where you are going. •Wear sturdy shoes and clothing, even if evacuating by car. You never know when you might have to abandon your vehicle, even if only temporarily. •If time allows, move valuables away from windows to interior rooms or protected locations, such as interior closets off the floor. •Notify your family communication coordinator of everyone’s plans. Remember that texts often work even if phone calls aren’t going through. •Bring in loose, lightweight outside objects that could be projectiles in high wind, such as patio furniture and garbage cans. Anchor objects that are unsafe to bring inside. •Cover all your home’s windows. •Charge all cell phones, computers, etc. •Talk to neighbors. Know what they’re doing. Make sure they know your plans. Exchange contact information. •If depending upon local shelters (I don’t recommend this), register any family members with special needs. I highly suggest having a bug-out bag, even if you only pack it for hurricane season. Bug-out bags (BOB) are very personal and people are passionate about them. You can find lists all over the internet of what to include. For example, I keep multiple methods of fire-starting in mine. But I realize the average person isn’t going to think this is necessary. They’re planning on evacuating to “civilization.” I’m prepared for more intense emergencies in which “civilization” can’t be relied upon. At a minimum: first-aid, 3 days water & food, clothing, medication, cash, flashlight, batteries, matches. • If you’re evacuating in a hurry, grab your bug-out-bag, medications, and important paperwork. • If you have a little more time (you should), there is a packing list below that includes the basics you need. It also includes things to do around the house before you leave. 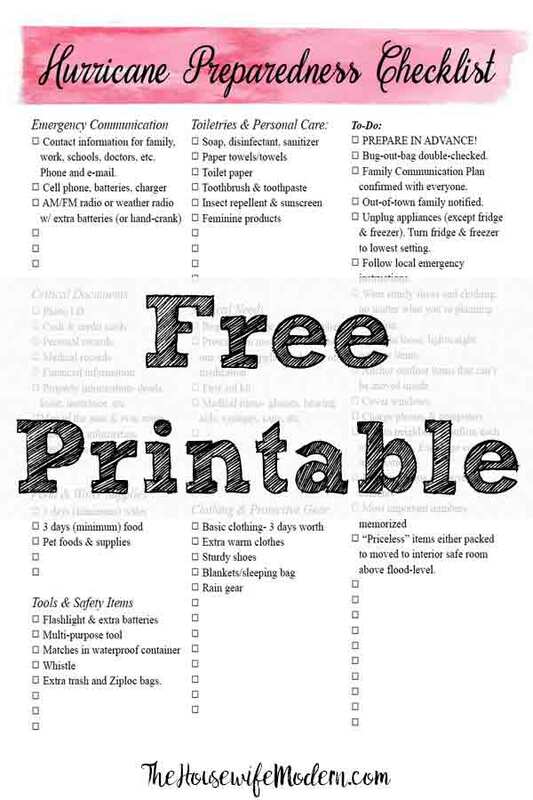 • If you have a TON of time, and want to pack thoroughly, I do have a travel packing checklist that is absolutely exhaustive. You can find it at: “Vacation Master Travel Packing List.” This is actually the list I used when we evacuated for Irma. Because we had plenty of warning that it was going to be an intense, intense storm. I also have a list of packing for babies, travel packing list for toddlers, and packing list for school-age children. Ready.gov- https://www.ready.gov/hurricanes has tips for surviving during hurricanes as well as other information. 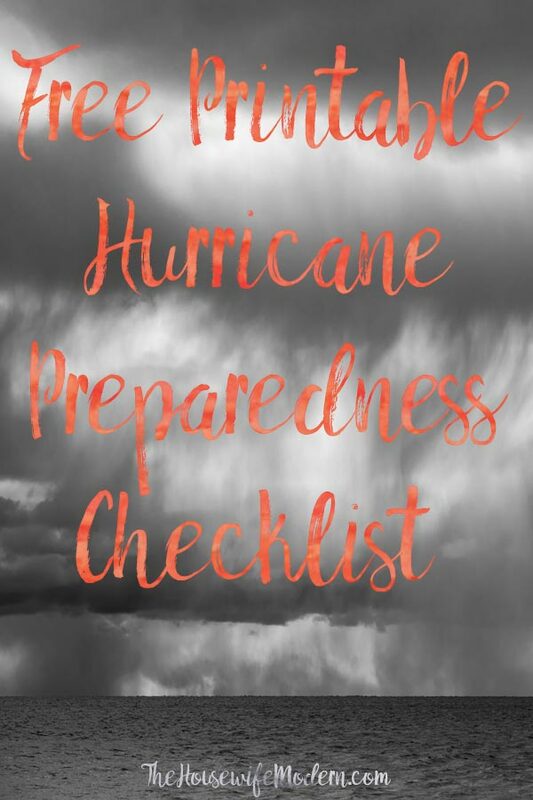 This post is designed to provide basic tips and hurricane evacuation packing list, not to be an entire “survive a hurricane” book. We just had hurricane Michael blow through up here in the panhandle. I was just reading through some articles to keep on top of my game! so I’m prepared even better next time! Loved your article, you have a lot of great information packed in it. Thanks so much for sharing! You’re welcome! I just evacuated for Hurricane Florence, but Michael came up through the states before hitting South Carolina. Though the winds were actually worse for Michael than Florence….you never know with these things. You’re welcome and thanks for commenting.